Jolly Lobby Track is the building security industry's leading visitor management/tracking system, allowing organizations of all sizes to register visitors to their facilities, print and issue badges and monitor or track visitor movement. In addition, this visitor management system checks your existing databases for duplicate records and automatically updates the information when duplicate data is found. It's capable of providing email notification to visitors who have registered online and to display online messages and alerts. Finally, lobby tracking software supports connectivity to other databases you may be using, including ORACLE. Jolly Lobby Track Premier is easy to install and simple to operate. It includes free factory support for the first 30 days and a year's worth of basic support from eXpress badging. Operation is fairly intuitive, especially with the built-in software function that allows visitors to register by simply scanning their driver's license, passport, business card or government ID. The system then takes that information, including photos and biometrics, and populates the database. As this is being accomplished, automatic crosschecks are being made against a variety of watch lists. 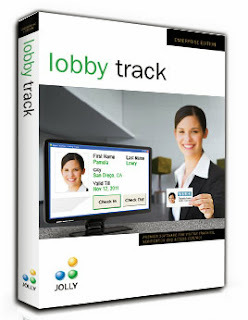 Jolly Lobby Track Premier is a unique, all-in-one visitor management/access control plus attendance and hours worked reporting solution. It's able to print temporary badges for visitors but also can make high quality permanent ID badges for employees. Cards can be one- or two-sided and card design is simple with the help of a Design Wizard. Elements such as database fields and text, shapes, images, magnetic stripes and barcodes can all be layered to create a professional looking credential. Captured photos and fingerprints can also be displayed. Various built-in reports can be created, viewed, printed and exported. These include information such as who is currently on site as well as histories of employee attendance and hours worked. One of the most important safety features of the Lobby Track System is the capability of protecting your facilities from unwanted visitors by way of the active, automatic Watch List feature. Policies can also be set up to deny access to certain areas based on location, time of day, etc. These are some of the outstanding features of Jolly Lobby Track Premier.